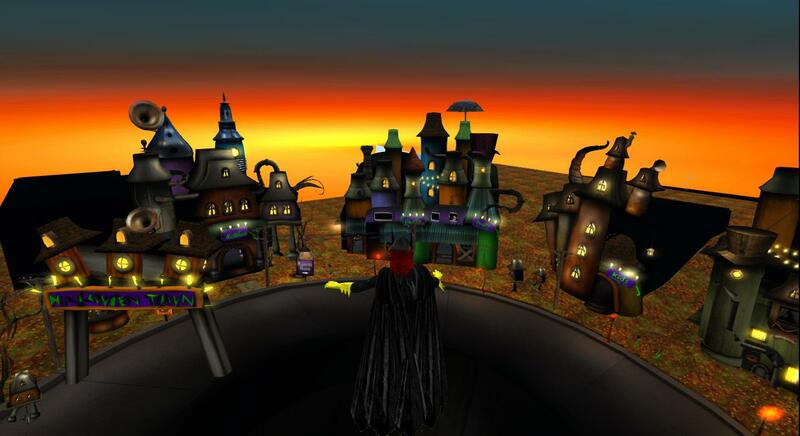 If you have the time and the wherewithal to go into the virtual world Second Life for Halloween, then I have the place for you: the Haunted House in Halloween Town. Now, I cannot take credit for finding this place. Last week I took my digital communication technology students into the social virtual world for one of their assignments — and, they all found it fascinating! But one of the fascinating places they found was an island created to represent a cartoonish yet absurdest rendition of a small village with one really big draw: it has a virtual haunted house designed to take you through some of the key moments from the scariest movies of the last several decades. 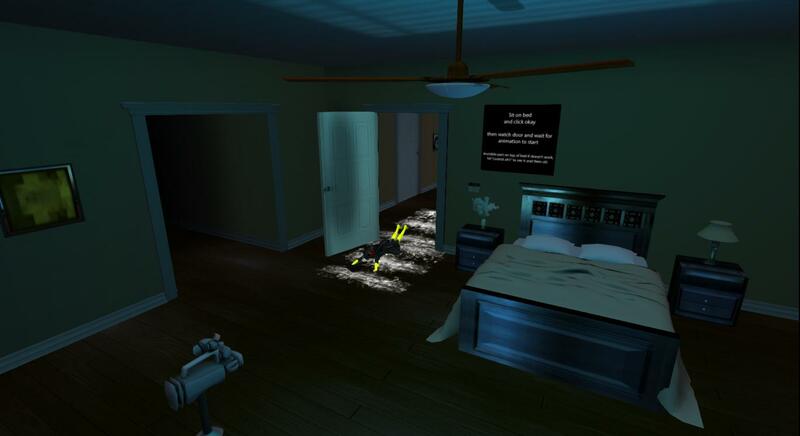 Images, sounds, and actions are replicated in this interactive haunted house, presenting an experience only possible in a virtual world. 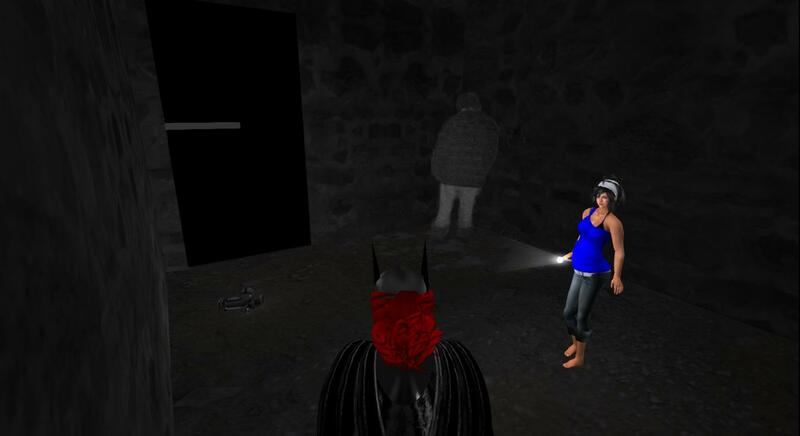 As you walk through the haunted house, you come across a series of different movie scenes, each of which allow you some type of interaction with the content of your favorite horror movies. 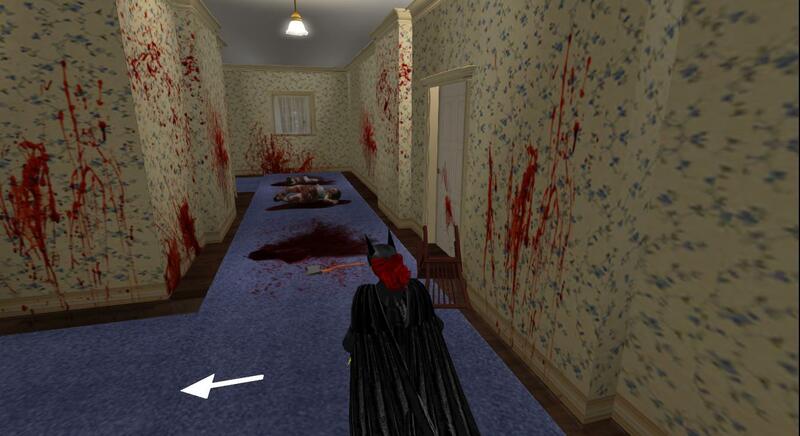 The first room depicts one of the scariest moments from Paranormal Activity, when the young woman, who is being harassed by the demon, is dragged off into the hallway in the middle of the night. And thanks to the interactive nature of the world, you are provided with the same experience — one not possible to recreate in a physical haunted house (at least, not without huge insurance liabilities). From this room you wander into the hallways of the Stanley Hotel, inspiration and scene for the classic horror movie, The Shining. Here the haunted house’s creators generated the famous scenes of the young boy cruising through the halls on his Big Wheels, only to find out the horrific nature of the hotel’s haunting inhabitants. In this recreation, you can ride behind the boy to view classic scenes, some recreated with gruesome accuracy. So far, these first two rooms represented some of my biggest scare moments in movies, but they were experienced with more fun than anything else. The same goes for the next room I came across, which had the dubious honor of being one of the single most scary things I had ever seen. Literally. I could not sleep that night because of it. The next time I watched the movie, I had to keep pausing it because of how worked up I was getting. I am of course talking about The Blair Witch Project, and that terrifying last shot. 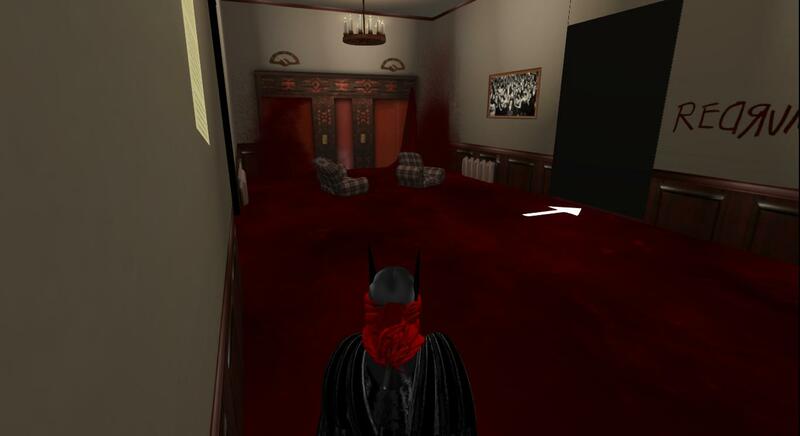 Other rooms followed as I wandered through the twisting, turning maze that was this virtual haunted house. I never did feel scared by what I was seeing except for one room — one that creeped me out so much I forgot to take a picture. The hallway was an ordinary white hallway, until you stepped into it — then the lights started to flicker. And ghostly dark figures start to flicker, materialize in and out of the hallway, slowing making their way towards you. A white orb danced and contorted itself amongst these images, spinning and whirling its way to you. All the while there was this noise…a noise like something strangling, like the death throes of something twisting in slow agony. And suddenly, as you walk down the hall, a doorway is thrown up, showing a woman in white with dark black hair, her body contorted in pain. It was a hallway designed to emulate The Grudge. And now I know why I haven’t seen that movie — that sound is not for the faint of heart, which I have. So I walked on. 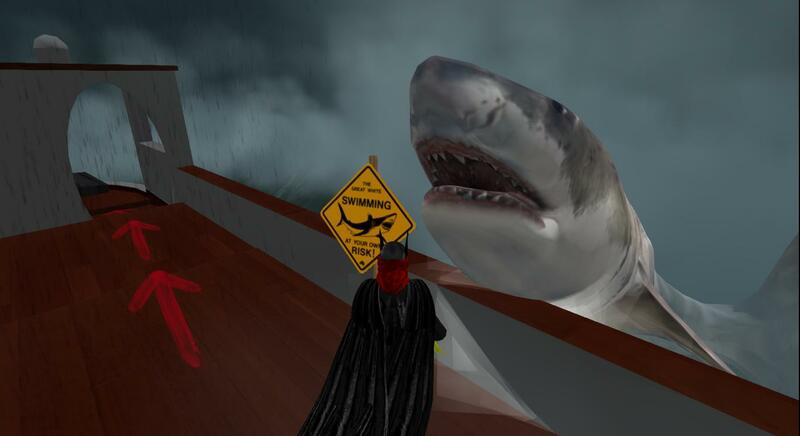 I came across a sinking boat in a powerful storm, and tempted fate in a bad way, only to end up in the jaws of, well, Jaws. I got in some quality time with a rather ill little girl — which was good, as my partner and I are doing research on her and her ilk. Poor Regan, giving me a lift, in The Exorcist. 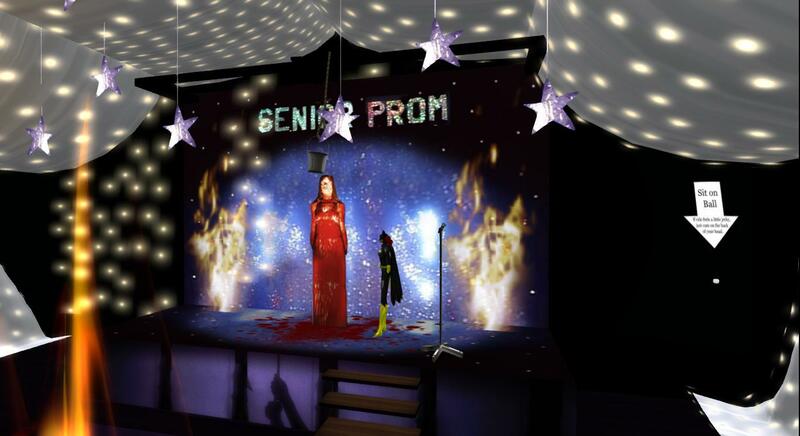 Easily my favorite experience of the virtual haunted house came in one of the last rooms, with a movie I do not really consider to be a horror movie — at least, not anymore. When I was a kid, there was plenty in this movie to freak me out. But since that time, having grown up with it and the wonderful animated television series, I have come to consider Beetlejuice to be Tim Burton’s masterpiece, and a movie I can quote ad nauseum. I dug the flying introduction to the model, in which the devious character was “uncovered” — but my favorite part followed it. I got to dance with the ghosts just like Lydia. 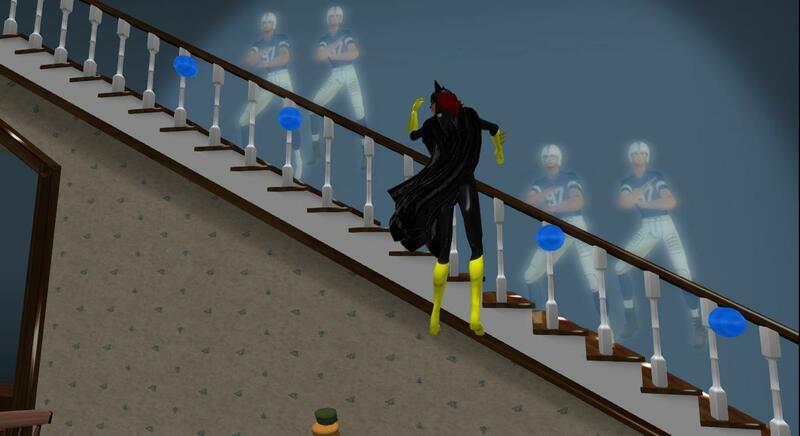 I only wish I could dance as good as my avatar in real life. 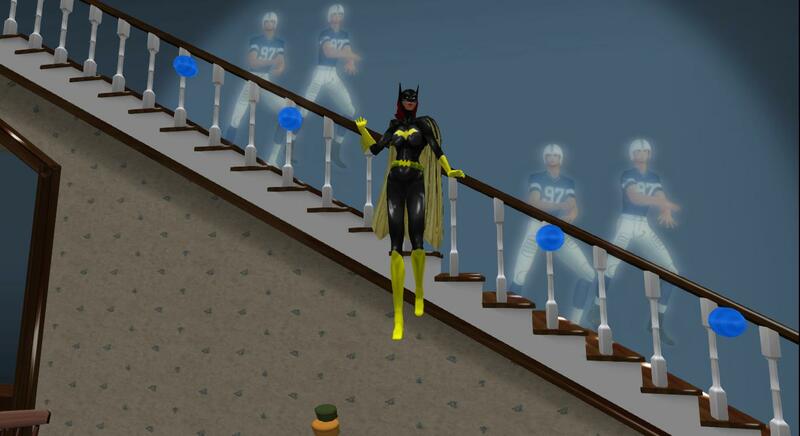 Maybe I just need a little ghostly assistance. I am glad my students stumbled across this island during their travels inworld last week. It is a fun walkthrough of some of the most iconic parts of some of the best the horror genre has given us. 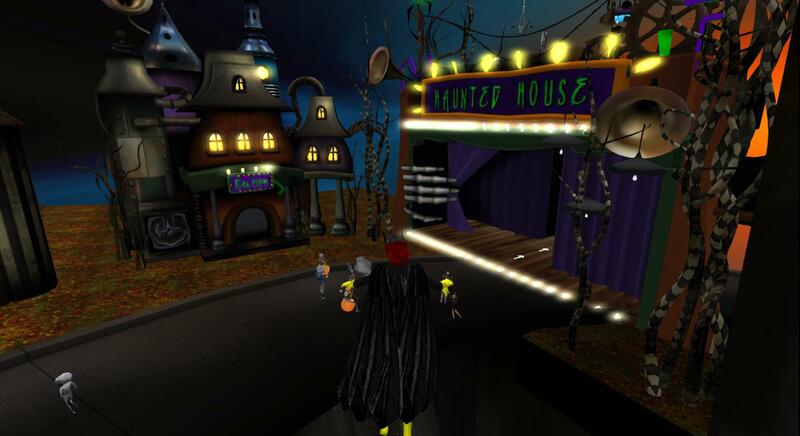 The creators of this virtual haunted house spent a lot of time and resources in the construction of it, and all of their efforts were not in vain. And while you could recreate aspects of these experiences in the real world — our movie-themed amusement parks like Universal Studies and Disneyland are built on that idea — you cannot get the one-on-one interactive experience in those real places and in this virtual place. 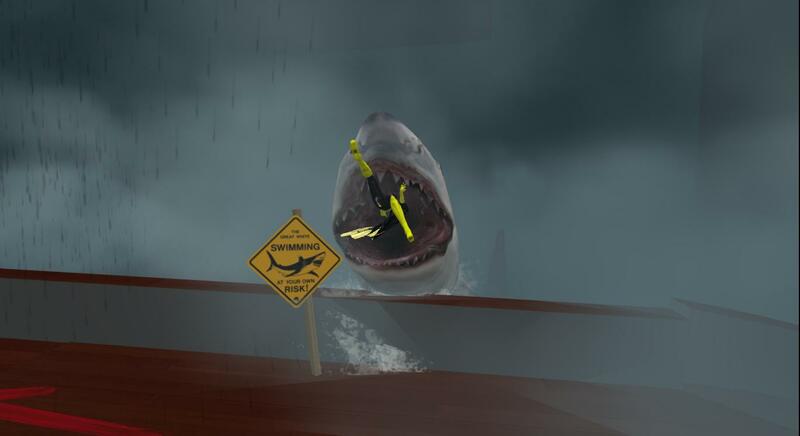 Sure, the shark from Jaws can launch itself at a car on a track, but it sure cannot eat that tourist. No insurance company would cover that. That would be a true nightmare. 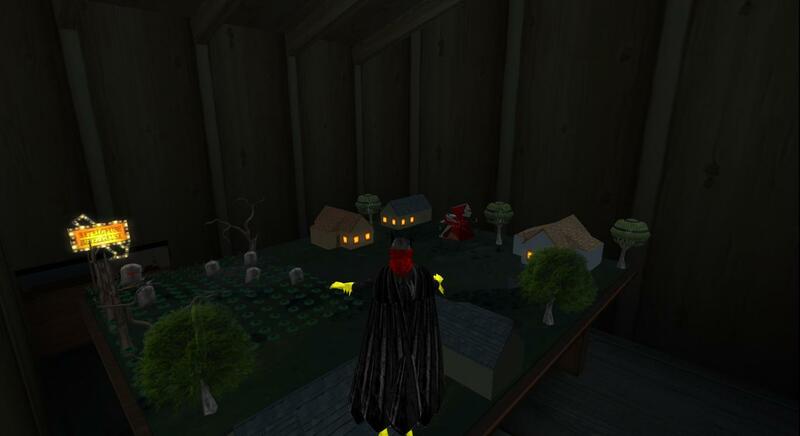 So if you are a horror buff, and if you can handle the sometimes buggy interface of Second Life, get your avatar on down to the Halloween Town Haunted House, before it vanishes, like a ghost upon the break of dawn.